What are battery amp hours? How to calculate amp hours? 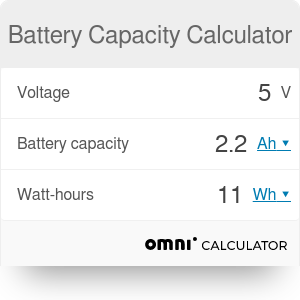 If you want to convert between amp hours and watt-hours or find the C-rate of a battery, give this battery capacity calculator a try. It is a handy tool that helps you understand how much energy is stored in the battery that your smartphone or a drone runs on. Additionally, it provides you with a step-by-step instruction on how to calculate amp hours and watt-hours, so you will be able to perform all of these calculations by yourself, too! Wondering how long your electrical device will run on this battery? Check out the battery life calculator! The primary function of a battery is to store energy. We usually measure this energy in watt-hours, which correspond to one watt of power sustained for one hour. If we want to calculate how much energy - so, in other words, how many watt-hours - are stored in a battery, you need information about the electric charge in the battery. This value is commonly expressed in amp hours - amps (units of electric current) multiplied by hours (units of time). Q is the battery capacity, measured in amp hours. Let's assume you want to find out the capacity of your battery, knowing its voltage and the energy stored in it. Note down the voltage. In this example, we will take a standard 12V battery. Choose the amount of energy stored in the battery. Let's say it's 26.4 Wh. The battery capacity is equal to 2.2 Ah. If you open the advanced mode of this battery capacity calculator, you will be able to compute three other parameters of a battery. C-rate of the battery. C-rate is used to describe how fast a battery charges and discharges. For example, a 1C battery needs one hour at 100 A to load 100 Ah. A 2C battery would need just half an hour to load 100 Ah, while a 0.5C battery requires two hours. Runtime to full capacity. It is simply the time t needed to fully charge or discharge the battery when using the discharge current, measured in minutes. You can calculate it as t = 1/C. Battery Capacity Calculator can be embedded on your website to enrich the content you wrote and make it easier for your visitors to understand your message.